Supported by a team of dexterous and immensely skilled professionals, we are engaged in manufacturing, trading and exporting an exclusive range of PVC Gumboots. We have made the use of PVC/ rubber in half/full form that ensures their alkali or acid resistance. 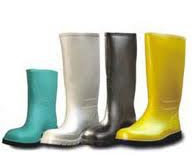 With anti-skid soles and fabric lining (with or without) these gumboots are offered as per the clients’ specifications. Our range finds it applications in petrochemical, construction, refineries chemical, and fertilizer industries.